Rescuers left them alone — and came back to find them snuggling. 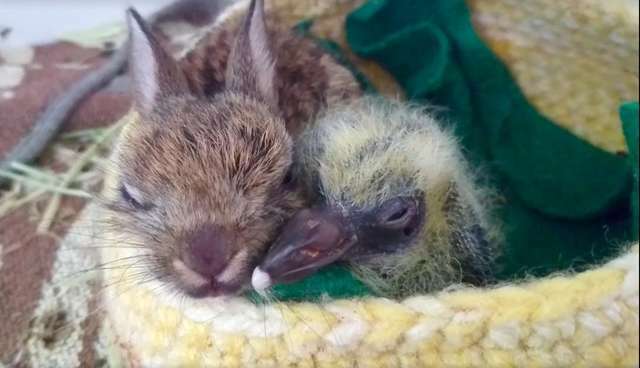 Until they're able to stand strong on their own, one rescued rabbit and pigeon are finding so much comfort in each other. The Kildare Animal Foundation Wildlife Unit in Ireland is currently home to the budding friendship between the two baby animals. Both orphans, they both came into the rescue's care separately. The rabbit arrived first in early August. He was so young that his umbilical cord was still attached, the foundation wrote on Facebook. His rescuers didn't expect him to make it - he was weak and his condition was unstable, and a seizure left him with an unsteady gait. Despite all of this, the rabbit proved to be far stronger than he looked. He continued to survive. Then, on August 12, rescuers at the foundation were alerted to a pressing situation. "We received a call from a lady who had found a pigeon's nest on the ground," Kildare wrote. "In it was a newly hatched chick and an unhatched egg. Sadly, the egg was cold and no longer viable, but the little chick appeared to be unharmed from the fall." The rescue took took the young chick in and was faced with a dilemma - both the baby pigeon and rabbit were in need of an incubator, but there was only one available at the time. It was decided that both babies could share the incubator - a divide was placed between them to keep them separated. "Both babies fed and settled down down well," the foundation wrote. "Imagine our foster carer's surprise when she next checked them and discovered that the divide had been overcome and these two had decided that life together was better than life apart." The rabbit, appropriately named Bunny, and the pigeon, called Pidg, are still happily growing up together, side by side. Bunny has become more confident in his hopping abilities, while Pidg has grown much larger, with full-fledged feathers taking the place of downy fuzz. One day, both animals will be released back into the wild. But for now the two still get to enjoy the simple joys of their unlikely friendship. "The comfort of two heartbeats together, of companionship, has crossed the species divide," the rescue wrote. "They are simply two little babies, finding comfort and warmth in each other's company." Want to help the Kildare Animal Foundation continue doing good work for animals in need? See how you can help make a contribution here.